I have been through high school, college and Lean Six Sigma training and nothing compares to the usefulness of this training in your workplace or home. An intensive learning experience that was thought provoking. I learned a tremendous amount that I can now apply. 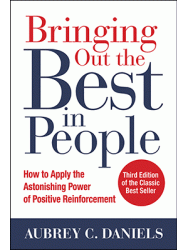 I really did enjoy the session and hope to be a shining example for others to see how to "Effectively Bring out the Best in People" through positive reinforcement. Everyone can learn this and should!!! The ADI process provides useable tools for managers to use in creating a reinforcing work environment. Managers should do themselves and their employees a favor – learn and use these tools. APMT delivers a very detailed system for managing people’s behaviors through knowledgeable, engaging instructors that provide you with a tool kit that you can use at work and at home. The best personal development class I have ever taken. Each day was structured to teach the powerful Performance Management Technology as well as develop the necessary skills in real time through well planned activities. I definitely had a lot of “now I understand” moments. Walking away, I felt empowered to change the culture of our Call Center. The Performance Management program is a great tool for any person no matter what your job title and provides direction on how to interact with people in your daily life. Awesome program! We need to send more people so we develop a critical mass of experience in R+. For a complete list of workshop offerings and scheduled dates, please refer to our Workshop Schedule.